Will I have to surrender all of my assets? What debts can be discharged through bankruptcy? Bankruptcy offers many benefits for individuals and families facing a severe financial crisis. By filing for bankruptcy, you may be able to eliminate your debt, while also ending the harassing calls from creditors and bill collectors. Bankruptcy also puts an immediate end to lawsuits, foreclosure and repossession proceedings. Determining your eligibility for bankruptcy can be a complex process. While there is a standardized Means Test that offers some insight into your eligibility, the questions on the test can be confusing. The best way to determine your eligibility to file for bankruptcy is to discuss your unique situation with an attorney. Filing for bankruptcy may require the sale of some of your assets. Many assets, such as a vehicle or personal items, are protected by federal and state exemptions, meaning that you are allowed to retain possession of them. It is important to discuss your specific asset concerns with your attorney before filing for bankruptcy. Much like your financial situation is unique to you, each bankruptcy proceeding is different. Some bankruptcy proceedings can be resolved in as little as 90 days, while others can take more than a year. Bankruptcy is a viable option for eliminating many types of debt, including credit card debt, medical bills, judgements, personal loans and more. Some debts cannot commonly be discharged through bankruptcy, however, including federal tax debts and student loans. 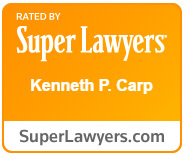 The Law Office of Kenneth P. Carp offers personalized bankruptcy guidance to clients in St. Louis and St. Charles County. Our detailed knowledge of state and federal bankruptcy law allows us to offer the comprehensive advice you need to end your financial worry and gain a fresh start to your financial future. Contact us or call (636) 947-3600 today to schedule a free initial consultation to discuss your case and your bankruptcy options.